Ellie is from Spokane Valley, WA and participated in the Korea Summer 2018 program. My host mother stands firmly by the principle that food, like all other good things, should be served with generous portions of love. Among the first questions she asked me were “잘 먹는 게 뭐 있어? (What do you like to eat? )” and “보통 미국에서 뭐 먹지? (What do you usually eat at home? 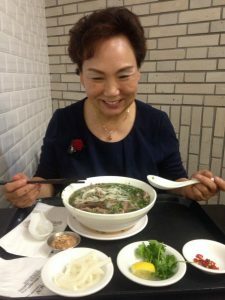 )” As I am not a very picky eater, I initially replied that I would eat whatever she made (and everything she made was indeed delicious), but she continued to ask. I quickly learned that these simple questions about my eating preferences were a reflection of her genuine care for me. My host mother often brought home snacks for me to try and diligently explained every dish she made. “배고프면 고구마도 있고 복숭아도 있는걸 알지? (You know if you’re hungry, there are sweet potatoes and peaches, right? ),” she’d ask. Her labors of love in making breakfast for me every morning were as sweet as the treats she insisted on filling our freezer with after finding out that I loved ice cream. It has been scientifically proven that eating together often allows families to bond- mealtimes are the perfect opportunity to spend time together, converse, and simply share good food. Though my host mother and sister don’t usually eat breakfast and I spent my lunchtimes at school, we ate dinner together almost every night. These meals together became some of the most precious and memorable moments of my experience. 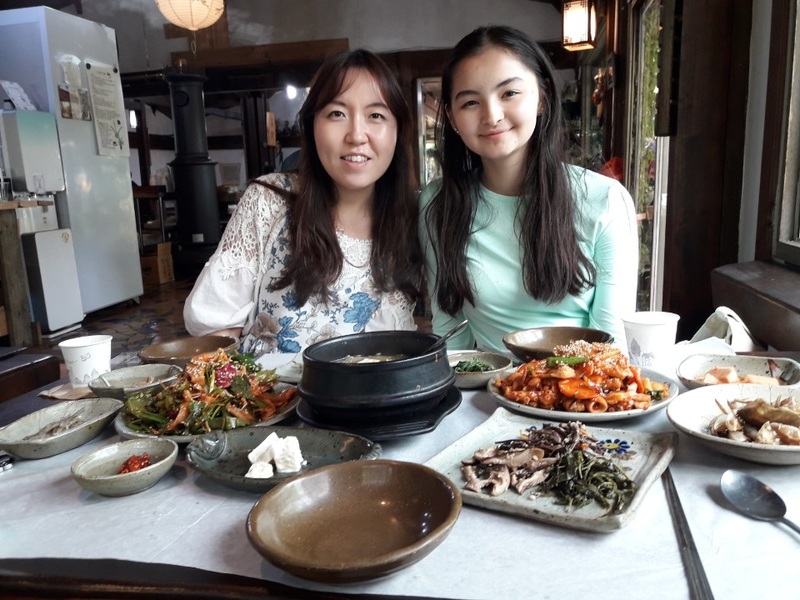 As we talked about our days, joked with each other, and told stories, not only did my bond with my host family grow, but so did my Korean skills. Mealtimes gave me a space to practice the grammar and vocabulary I’d learned in class and trained my ears to pick up commonly used speech patterns. I even learned a few words from my host mother’s local dialect, such as 청려장, the Jeollado word for walking stick, which is 지팡이 in standard Korean. Our dinners together became an opportunity to share culture. 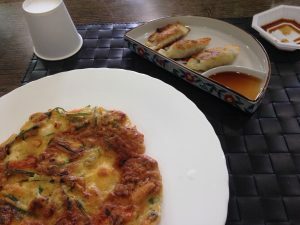 Once, a question about what my host mother was making led to an explanation of 복날, the three hottest days of the year, and the foods traditionally eaten on those days. My host mother was insatiably curious about what typical American families eat, and my host sister begged me to tell my host mother that not all Americans eat steak or pasta every night. 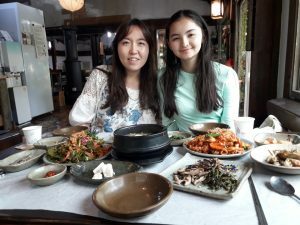 When I explained that “가족마다 다르거든요 (Each family is different),” my host mother told me to make a presentation for her of common foods in the U.S. We were then able to have conversations about the diversity of American families. Whether buying 떡볶이 (spicy rice cakes) with the young people’s group at my host sister’s church, learning about Korean foods at a traditional market with my supporter group, or sharing a look of “냉면 더 사 먹을까? 냉면 더 먹자 (Should we eat more noodles? Let’s eat more noodles)” with my host mother, I have learned that food connects people. 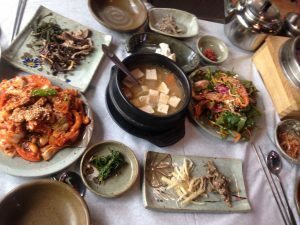 Sharing meals with my host family and friends allowed me to grow closer to them, practice Korean, and learn about Korean culture. Food has also provided me with an opportunity to share American culture with my host family and a way to share Korean culture with my community in the U.S. I am incredibly grateful for this seemingly insignificant part of my daily routine that allowed me to form good relationships and through which I received so much love from the people around me while on program.